Our line of GOR bulbs are some of the highest quality bulbs of their size in the industry. The 1.5V clear GRS505 bulb has proven to be an excellent loco and tender light for the larger O scale rolling stock. These 1.5V GOR size bulbs can be used on larger S, O, and G scale static models in lieu of the 1.5V micro bulbs provided in the liting kits. They work very well on emergency vehicles that come with the colored "gumballs" or lite bars already in place. These bulbs can also be used with the GRS1012 Vehicle Headlight/Taillight Liting Kit provided the model has plastic lens covers on both the headlight and taillights. Specifications: 1.5V (35ma), 3.0V (40ma. ), 0.092" dia., 8" insulated leads, 5,000 hr. life. 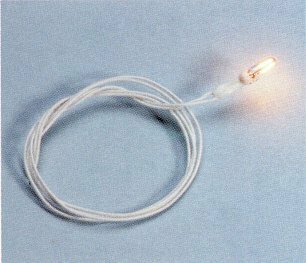 The insulated leads measure a mere .018" in diameter and the insulation at the base of the bulb is half the diameter of the bulb.